Due to the effects of aging, our eyes can begin to stretch, wrinkle, and fatty deposits build up around our eyes. This can cause the tissue to bulge and the upper eyelids begin to sag. No matter how well you take care of yourself, you can begin to appear sad, older, or tired. With time, the skin just begins to lose its collagen and elasticity, resulting in this undesired look. Fortunately, with blepharoplasty-or eyelid rejuvenation-we can restore your natural and radiant appearance. This particular surgical treatment can restore the youthful appearance of the eye area, including the lower and upper eyelids. These are lifted, while excess fat tissue and skin are removed. This same method of treatment can be used to address other areas of the face in a similar manner. To complete Blepharoplasty on the upper eyelid an incision will be made in a discreet area such as the lash line or the natural crease. The loose, sagging skin is removed. The incision is then sutured along the same crease to keep it natural. The procedure takes about two hours and it is performed under general anesthesia as an outpatient procedure. A lower Blepharoplasty removes excess skin by making an incision along your lower lid. The skin is peeled back and the loose or sagging skin is removed from the exterior as well as the underlying fat pad. The pad is then cauterized (heat-sealed) and the incision is sutured. This surgical procedure can take approximately two hours to complete, and is performed under local anesthesia. The effects of treatment after the operation are temporary and minimal, but you are expected to limit activities and any vision strain for one to two weeks. This means, no reading, watching television or putting any strain on your eyes that can cause further inflammation, or swelling. After five days, the stitches are removed, and you may experience minor swelling, discomfort, and bruising. However, this should disappear within a few weeks. Cold compresses are used to alleviate these side effects, and with the proper post-operative care, these effects will be minimal. 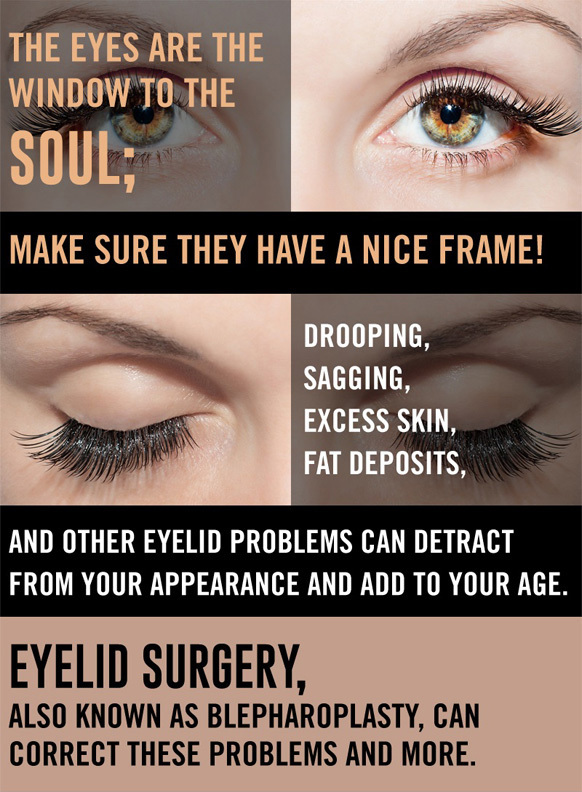 For more information, or to schedule your consultation, call Foothill Cosmetic Surgery Center today and be a step closer to having younger, vibrant eyes.